Bucket tests and experimental products are one thing. But to mess with the real Google search is serious stuff. Why did they do it? Google’s overall search share has grown substantially this year (and all other years since it went live). Their share of search advertising dollars is likely even higher. The changes Google made to search today certainly make it more interactive and social. 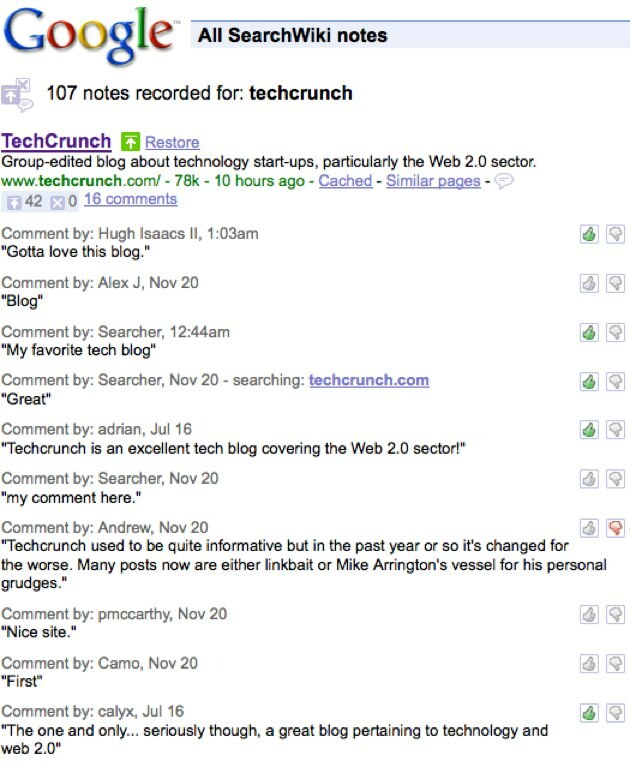 I can now write comments on search results, and read comments from everyone about TechCrunch (or anything else – see the awesomely useful TechCrunch comments in the image below, along with my votes on each) and vote them up or down. I can move search results around on the page – up, down, or off the page entirely. I can also add other URLs into search results. In fact. Google paid Wikia Search the highest compliment possible today. They copied most of their features. In their blog post, Google says they’ve created a way to customize search results, and share (via the comments). They say they are striving to improve the search experience, and giving people tools to make search even more useful to them in their daily lives. But Google search wasn’t broken. It’s one of the few things on the Internet that isn’t. I love it, as does 62% of everyone on the Internet. This new stuff is a mess of arrows and troll comments and stuff moving around the page. That doesn’t make my search experience more useful. It makes it move to another search engine. My guess is they’ve made the changes to see what kind of data they get, and how it can be used to make their overall search results better. So when Google says “The changes you make only affect your own searches,” I think they’re only being half-truthful. All this data, in aggregate, will certainly be used to improve Google search results in general. The worst part of the new stuff is you can’t turn it off. Once you click “Yes, continue” you’re in. And as far as I can tell, you can’t get back to the good old Google that worked just fine. Google, I’m begging. Please pull a Lively and get rid of this thing fast.